Excess carbon dioxide, emitted by burning fossil fuels like coal and petroleum, is one of the most important factors in driving global warming. While the world is focused on controlling global warming by limiting these emissions, less attention has been paid to the capacity of vegetation and soils to take up and store carbon. 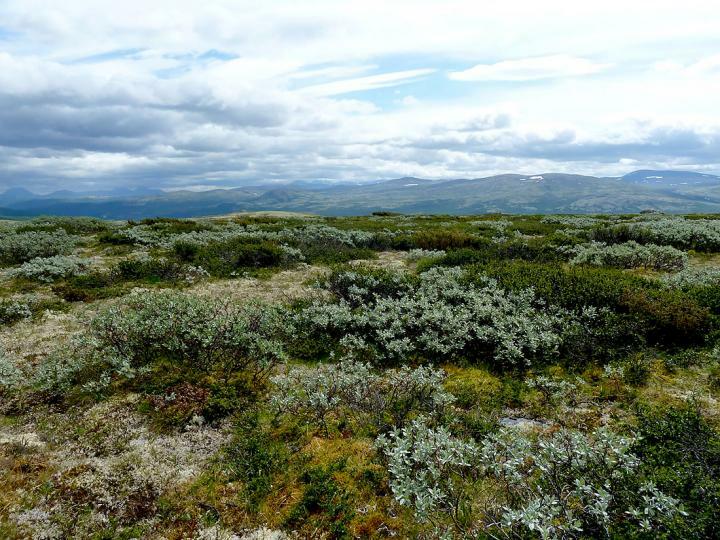 "We don't think about how much carbon is actually stored right in our own backyard," says Mia Vedel Sørensen, a PhD candidate at NTNU's Department of Biology who is studying carbon storage in shrub vegetation in the Dovre mountains, in mid-Norway. "I wanted to figure out how much carbon these three vegetation types store and release. My hypothesis was that shrubs store more carbon than heath and meadow vegetation because shrubs have more biomass, and thus have higher rates of photosynthesis," she said. Climate change is altering the mix of vegetation in arctic and alpine areas. That's particularly true in Norway's mountains, where shrub thickets are expanding in area. That's also partly a cultural change, because changing farming practices result in fewer animals in the mountains. This allows shrubs to grow in places where animals such as sheep might have once eaten shrub seedlings, while a warmer climate means that shrubs can grow at higher elevations in the mountains. "It is important to find out what happens to carbon capture and storage when shrubs and bushes take over areas that used to be covered by heath vegetation. How will carbon storage be affected in alpine and arctic regions when shrub communities expand at the expense of meadow and heaths?" Sørensen said. "There hasn't been much research on this previously, so it is interesting to find out more about how much carbon is actually stored in the soil," she said. "Our hypothesis is that it is related to what is happening underground, such as how the roots grow. It may also be related to mycorrhizae, which are fungi that grow in a symbiotic association with plant roots and that can have an effect on carbon emissions. Mycorrhizae are found in both shrubs and in heaths, but not so much in meadow vegetation," Sørensen said. She will also look at what happens to the carbon budget when shrubs are transplanted in meadow and health vegetation, and what happens if a protective enclosure is set up around plants so that sheep and other grazing animals aren't able to eat the vegetation, she said. Sørensen's research is part of a major research project called ECOSHRUB, which is a collaboration between NTNU, Nord University, the University of Antwerp, Ghent University, the State Museum of Natural History in Karlsruhe and the University of Arizona.